Griggs Dakota: Haywire or Macgyver? For people who live in the country, making do with what you have on hand becomes a way of life. There are two sides to this. Farmers in general tend to be cheap and like to spend the least amount possible on many things, especially things that seem temporary to them. An example of something temporary could be ... well, anything and everything. There must be a few exceptions, but I can't list any that are always exceptions. When we have a bad year on the farm, they are cheap on everything. If the year is just okay, they might splurge and buy their wife a new vacuum cleaner or other expensive, but practical present for Christmas. If they have a good year, they will be very quiet and very cheap, but their children's college fund gets a generous contribution and the church gets an extra end of the season check in the offering plate. Generally farmers are thrifty in every area. Thrift plus Distance often equals Invention. When we want something, or need to fix something, we generally look around to see what we can put together. Grampa Sonny would call that "haywire." Haywire is the wire that is sometimes used to hold small square bales together. In my memory we have always used twine on the bales in GriggsDakota. Apparently he remembers hay being wired together and thus the term. I am more familiar with the wire used for our electric fences and we use the two wires interchangeably in all haywire projects. We wire together the parts we find to make something or fix something. Often we don't use wire at all. We weld, nail, glue, tie, refabricate, look around, improvise, and pat ourselves on the back for being ingenious ... and cheap. For those from GriggsDakota this way of life is second nature. Most of us have always considered ourselves pretty inventive in a haywire sort of way. But Macgyver was the character that made it cool. He was a secret agent who could succeed in any adventure with his ability to haywire simple items into just what he needed to escape or win the battle. He was "always prepared for adventure." Well, I'd say we are always prepared for adventure in GriggsDakota. His motivation was not just his thrifty nature, but the fact that he could conquer any criminal with his wit. All he needed was common everyday items. "His mind is the ultimate weapon." Well, we really don't need any weapons except our hunting rifles, but I've always been told that I have a mind of my own. Maybe I think like Macgyver. 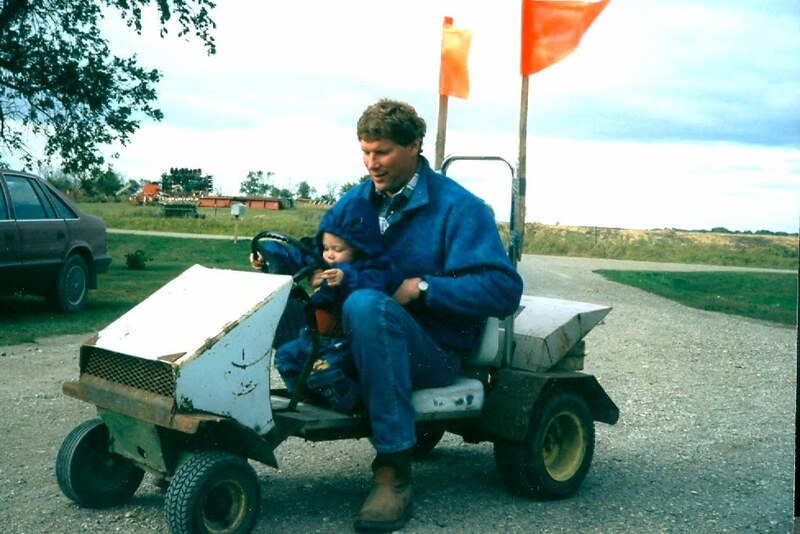 He didn't have a farm background that I recall, but I think he liked hockey and so do all the sports fans in GriggsDakota! We were thrilled when Wishek Nathan introduced us to the term "Macgyvering!" How cool to be associated with success and adventure as you put together the things you can find to make or fix something. It is a positive mindset. 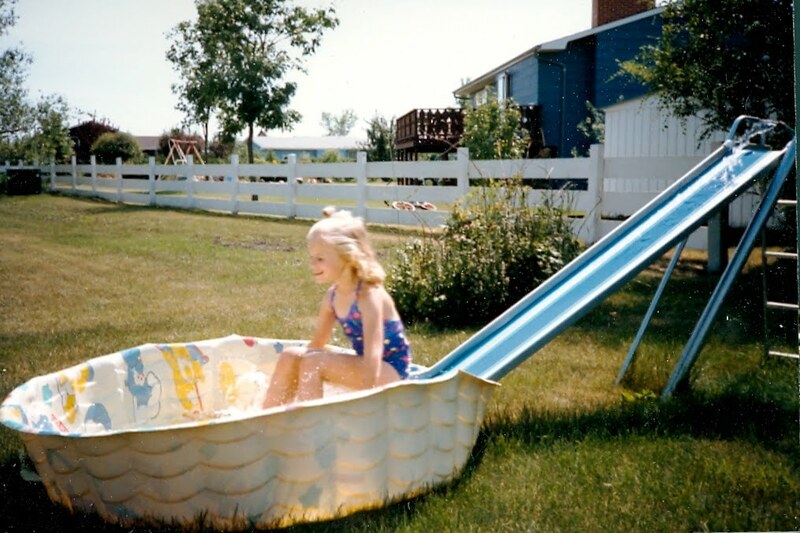 I came across this photo taken long ago of our back yard water slide. We were living in a city and I Macgyvered the hose to the top of the slide and put a wading pool at the bottom. Some of the people that saw it shook their heads as they packed up their kids for the pool, but most just smiled. There were hot summer days when the children in the neighborhood lined up for their turn to fly down and splash in. I had as much fun as anyone while I was standing by the slide and supervising. Macgyvering makes us feel like we aren't just being cheap, but rather clever and resourceful. We can Macgyver any problem. We have a neighbor that might have taught Macgyver a thing or two with his talent for hay wiring this and that to make something useful and often fun. He Macgyvered this go-cart and sold it to me for almost nothing. Our children, their cousins, friends and even Farmer Fred have had countless hours of fun riding on it. We also have a big sled that he made and gave to us for Christmas. He Macgyvered an old plastic tank by washing it repeatedly, disinfecting it with bleach, cutting it then smoothing the edges, and applying necessary details. The metal hitch is sturdy enough to pull with a snowmobile or other vehicle and the wooden bar allows the rider to hold on tight. The snow makes it hard to see, but the details are clearer if you enlarge the photo. Being cheap is an adventure now. We're saving the world! Thanks to Wishek Nathan and of course, Macgyver. That homemade water slide was my favorite! And I married to the modern day Macgyver now. Wishek Nathan can macgyver anything! It is amazing what can be done with some duct tape and a swiss army knife! I have never however made a bicycle into a cutting torch to open the door of an armored car the way the "real" Macgyver did! I remember that pool in the "city." I know 3 kids who lived south of you enjoyed that water slide numerous days! Over here in the UK, I remember the hay wire. For years after hay wire had been taken over by sisal twine, broken gate hinges were held together with hay wire and the gate catches were wired. Sisal twine rotted, but when the polly twine began to appear you could find gate held up with that, and still do. Being foreign to some of your sayings I had to look up your word "Macgyver", over here in UK we have "Heath Robinson", as someone who can cobble together something from nothing.